The subject of this sketch was the youngest child of Thomas and Zelicha Yancey and was born in New Liberty, Owen Co., Kentucky 3 March 1847. 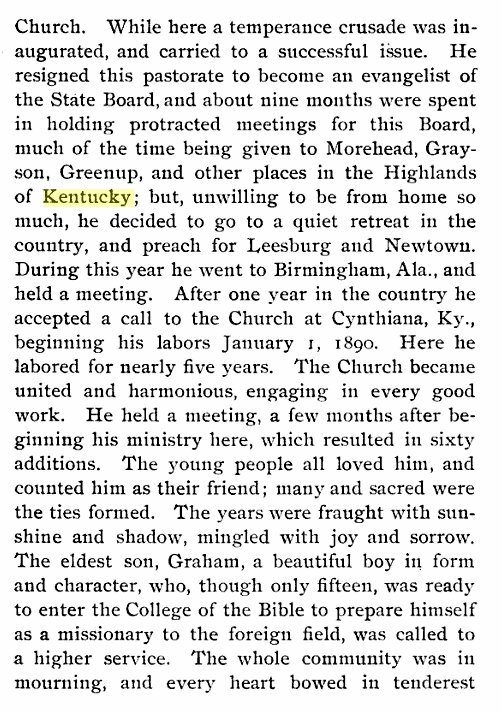 His father was a Virginian, being a cousin of Wm. 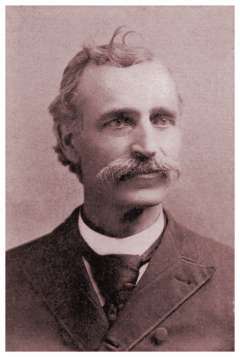 L. Yancey of Confederate fame. His mother was first cousin of the Morton brothers who were pioneer preachers of the Restoration. From both father and mother he inherited a fine physique and a strong mind. When two years of age his father died, leaving the mother and five children. She journeyed to Missouri and here on the prairies of this new country Worth Yancey spent his boyhood days. He left his home at the early age of thirteen to make his own way. At sixteen he entered the office of the Palmyra Spectator and learned the art of printing. About this time he united with the church [Church of Christ] and soon afterwards decided to become a preacher of the Gospel. To this end he spent every energy, reading and studying every spare moment. He became a proficient typesetter, earning good wages which he laid by for his college course. At the age of 19 he entered Kentucky University. He graduated from both the college of the Bible and the University with honors - beloved by faculty and student body. 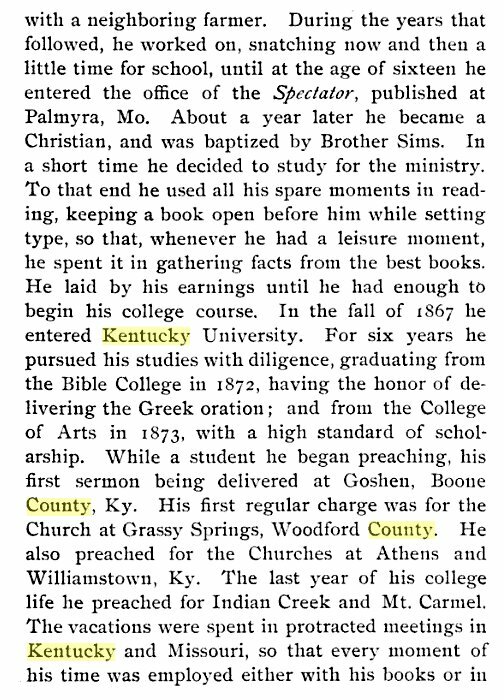 During nearly all of his college course he preached regularly every Sunday. His vacations were spent in protracted meetings in Kentucky and Missouri. 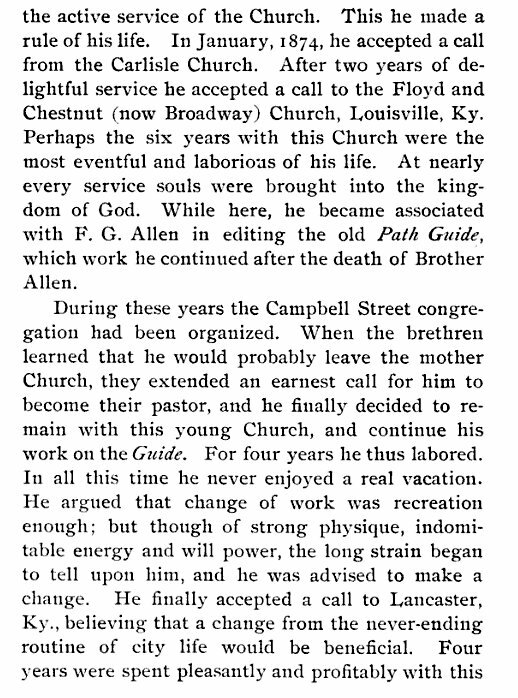 After graduating he was called to Carlisle, then to Floyd and Chestnut Street Church Louisville, (now Brodway), laboring with this church for six years, then the Campbell church four years, Cynthian church five years, where his health failed. His last sermon was preached 30 Sep 1894. On 7 Sept 1896 at Williamstown, Ky his bouyant spirit with "glimpse of the farther shore" was released from its tenant of clay. 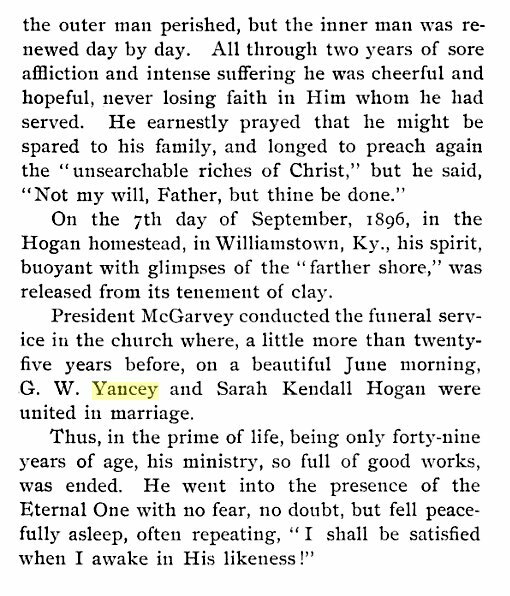 On 9 June 1871 he was united in marriage to Sarah Kendall Hogan of Williamstown, Ky, who with two sons, of Worth and Hogan, and a little daughter Lela survive him. Graham the eldest son preceded his father to the homeland. 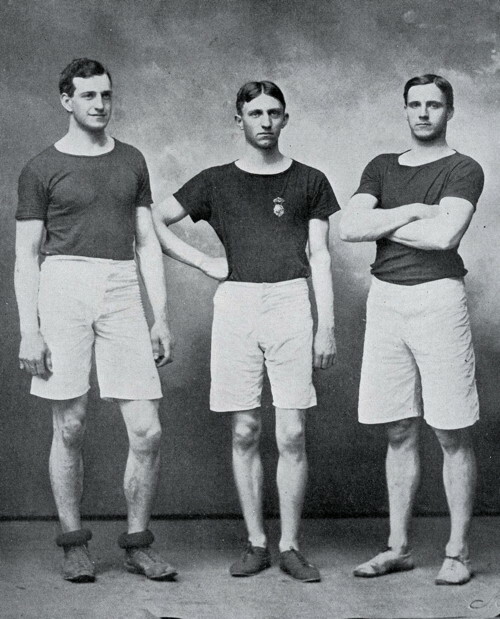 The Yancey brothers were all-around athletes. 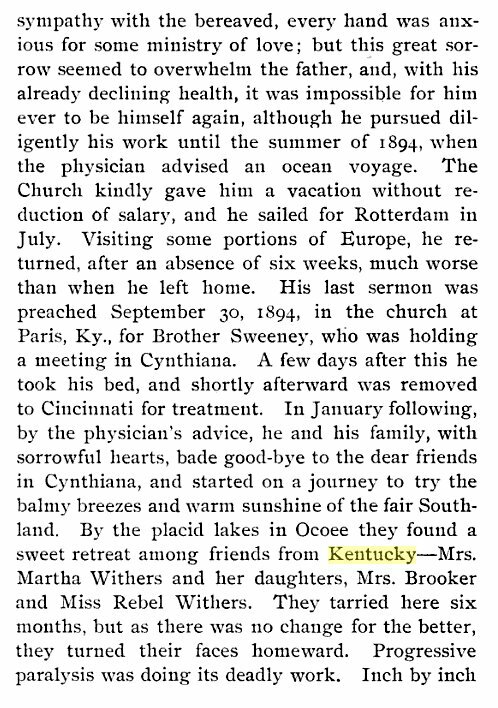 Their late father, George Worth Yancey had graduated from Kentucky University and become a minister. Worth was two years older than Hogan and while originally from Kentucky, they grew up in the Leesburg Va. area. Hogan had attended South Carolina in Columbia for one year before transferring to K.U. to finish his studies. In addition to starting, he served as manager of the team. Another development for Transylvania occurred during this time when one of their alumni, Hogan Yancey, agreed to return to the school as coach and athletic director. Yancey had been playing professional baseball and making a name for himself in coaching at such places as Jacksonville Florida and Rochester New York. He began to coach football and baseball at the school, taking time off in the summer to continue to play professional baseball. 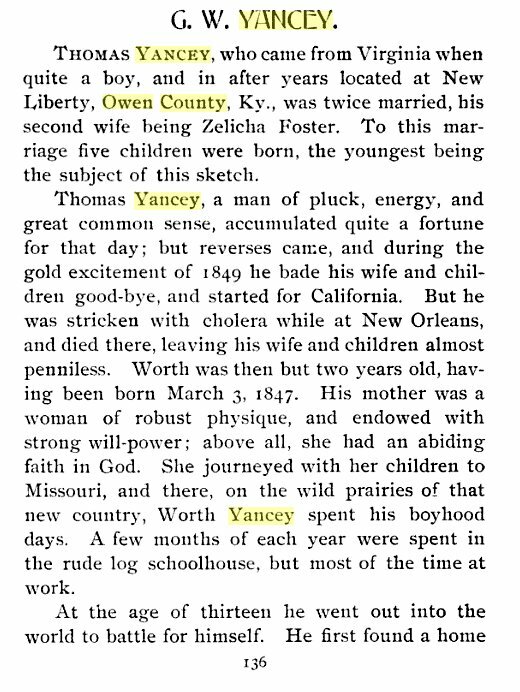 Yancey was a man about town. In addition to his duties with the sports teams, he also managed to get his law degree from Transylvania. At one point he even found time to pose for the Confederate General John Hunt Morgan monument which sits in downtown Lexington. Unfortunately for local fans, the ill feelings lingered through the years. More times than not, games were not played between the two schools. Part of this might be attributed to disagreement over the eligibility of players, given that standards were different between the Southern Intercollegiate Athletic Association (S.I.A.A., which State was a member of and Transylvania would join in 1914) and the K.I.A.A. (which both were members of, except for the times they weren't, such as when Transylvania abolished sports in the Spring of 1906 and later withdrew from the association that summer). To add fuel to the fire, an iron arch with the words "Kentucky University" which hung over an entrance-way from Broadway to the Transylvania campus was sawed off and stolen one night in 1909. The theft, done presumably by State students opposed to their sister school's use of the out-of-date name, upset Transylvania students and alumni and did nothing to improve relations between the two student bodies. Since their last meeting in 1908, much had changed. 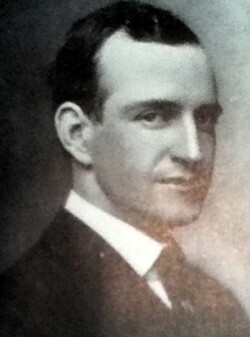 Hogan Yancey had moved on to take part-ownership in a local Lexington professional baseball team. (Yancey also dabbled in local professional basketball with a team called the Kentucky "All-Stars") At the same time he began practicing law and flirted with politics; eventually in the 1920's he would be elected Democratic mayor of Lexington. His older brother Worth also played professional baseball and became an attorney, but died young in 1913.